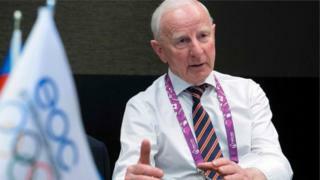 Irish Foreign Minister Charlie Flanagan has agreed to meet the family of former Olympic official Pat Hickey to discuss their concerns about his health. Mr Hickey's family have said they are "gravely concerned" as he continues to be held in a Brazilian prison. He was arrested in connection with the alleged illegal sale of Olympic tickets. Mr Hickey is currently being detained in the maximum security Bangu 10 prison in Rio. The former Olympic Council of Ireland president has denied any wrongdoing. He has yet to be charged. He has stepped down from his roles at the International Olympics Committee and the OCI temporarily. In a statement, Mr Flanagan said he had "agreed to meet the Hickey family and arrangements will be made for this meeting to take place in the coming days". "In the meantime, my department is continuing to monitor developments in this consular case closely and is continuing to provide all appropriate consular advice and assistance to Mr. Hickey and his family." Mr Hickey's family had said they were hoping to meet Taoiseach (Irish prime minister) Enda Kenny over his continued detention. Mr Hickey complained of heart problems and was taken to hospital after he was arrested last Wednesday. Images of his dramatic early-morning arrest showed Mr Hickey being taken from his hotel in his dressing gown. His lawyers denied that he had tried to escape, after it was reported his wife told police that he had returned to Ireland. On Tuesday, police said they had found emails that linked Mr Hickey to the head of a company alleged to have illegally resold Olympic tickets. His family, in a statement issued through a solicitor, called on Mr Flanagan and Sports Minister Shane Ross to "urgently intervene in addressing the extremely worrying issues surrounding his arrest and detention". The statement outlined several areas of concern for the family including his health, his right to a fair hearing and "pre-trial disclosure of evidence to the media without any right of a reply". "The arrest and detention occurred over seven days ago and still no charges have been brought, nor has an appropriate venue for a bail application been made available to Pat Hickey." The statement added that Mr Hickey has a "serious heart condition" and they are "extremely anxious that he be immediately released on bail and given the opportunity to respond to the accusations". "They also, as a priority, want to get him home to Ireland as they have increasing concerns about his safety." It called on Mr Flanagan to issue a statement setting out steps his department is taking to "object to the manner in which an elderly Irish citizen was arrested and is still being detained in Brazil". "It was entirely inappropriate and unacceptable for a 71-year-old Irish citizen be taken from his bedroom, arrested, walked in a state of undress before a pre-arranged camera crew, after which film and still shots were released to the global media." On Thursday, two OCI officials were told a judge will decide whether to return their passports after they were questioned by police in relation to the illegal ticket sales investigation. The Olympic Council of Ireland has appointed accountants Grant Thornton to conduct an independent review of its handling of ticketing arrangements for the Rio games. It says the review will be completed by 10 October and passed to Judge Carroll Moran to consider as part of the Irish government's inquiry deliberations.